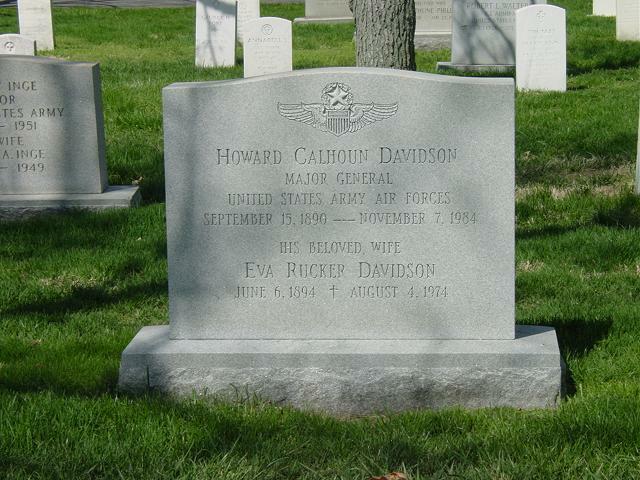 Howard Calhoun Davidson was born in Wharton, Texas, in 1890. Following graduation from the U.S. Military Academy at West Point, New York, he was appointed a Second Lieutenant of Infantry on June 12, 1913. He was promoted to First Lieutenant July 1, 1916; to Captain May 15, 1917; and to major (temporary) June 17, 1918. He reverted to his permanent rank of Captain October 15, 1919, and was promoted to Major July 1, 1920; was transferred to the Air Service on that same date, July 1, 1920; was promoted to Lieutenant Colonel August 1, 1935; to Colonel (temporary) August 1, 1939; to Brigadier General (temporary) April 7, 1941; to Major General (temporary) January 13, 1944. He first was assigned to the 22nd Infantry and was stationed at Texas City, Texas, from September 1913, to November 1914; at Naco, Arizona, to February 1915; and at Douglas, Arizona, to July 1915. That same month he was transferred to the 24th Infantry and served with this regiment in the Philippines until September 1915, when he was transferred to the 27th Infantry. Detailed to the Aviation Section, Signal Corps, he attended the Aviation School at San Diego, California, and upon the completion of the course received the rating of junior military aviator. He joined the First Aero Squadron at Columbus, New Mexico, in September 1916, and served on border patrol duty and also with the Punitive Expedition into Mexico. In February 1915, he joined the Third Aero Squadron, and served with this organization until May 1917, when he was assigned as commandant of the School of Military Aeroautics at Cornell University, Ithaca, New York. The following October he sailed for France and was stationed at Paris and later at Tours as personnel officer at Air Service headquarters until February 1918. He had charge of flying at the Second Aviation Instruction Center at Tours, France, to August 1918, and was Corps Air Service commander, VII Army Corps, from September 1918, to April 1919. He returned to Paris as a student at Sorbonne University from April to July 1919. Upon his return to the United States in August 1919, he was assigned to McCook Field, Dayton, Ohio, for duty in the Power Plant Section. He assumed the duty of supply officer in November 1919, and Quartermaster from August to October 1920. In September 1921, he was assigned to the Air Service Engineering School at McCook Field. Upon his graduation from this school in July 1922, he was assigned to duty as assistant military attache at the American Embassy in London, England. At the end of his four-year tour of duty in London, he went to Mitchel Field, New York, in September 1926, where he served as operations officer and performed various other duties, until December 1927. After several weeks as commanding officer of Mitchel Field, he was assigned to the command of Bolling Field, D.C., in January 1928. He attended the Air Corps Tactical School at Maxwell Field, Alabama, and upon his graduation in 1933 pursued the course of instruction at the Command and General Staff School at Fort Leavenworth, Kansas, graduating in 1935. His next assignment was with the 19th Bombardment Group as commanding officer, and served with this organization both at Rockwell Field and at March Field, California. He was transferred to the Office of the Chief of the Air Corps, Washington, D.C., and assigned as executive officer in September 1936. He served in that capacity until September 1939, when he entered the Army War College at Washington, D.C., as a student officer. Upon graduation from the Army War College in June 1940, he was ordered to the Hawaiian Islands for duty as commanding officer of Hickam Field. Subsequently he was named executive officer of a bombardment wing at Hickam Field until April 1941, when he assumed command of the 14th Pursuit Wing at Wheeler Field, Hawaii. The following July he became commanding general of the Hawaiian Interceptor Command, and served in that capacity until December 1941. He then became commanding general of the Seventh Air Force, and in June 1942, became commanding general of the Seventh Fighter Command, until November 1942, when he returned to the United States and was assigned to the Army Air Forces Technical Training Command, Mississippi, Delta Area, Gulfport, Mississippi, as commanding general, for a brief tour of duty. He then was named special projects officer at the Proving Ground Command at Eglin Field, Florida. He assumed command of the Tenth Air Force in July 1943. He is rated a command pilot, combat observer, and aircraft observer.